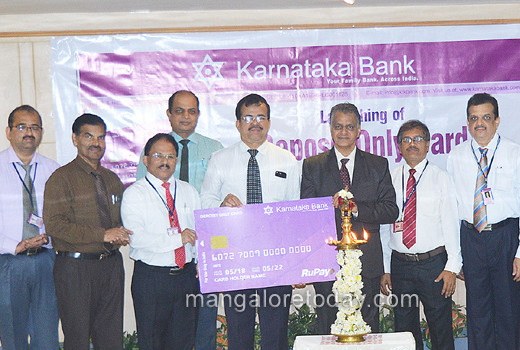 Mangaluru, June 14, 2018: Karnataka Bank, as part of its digital initiative, has unveiled yet another novel card variant ‘KBL-Deposit Only Card’, which enables hassle-free cash deposit transactions at Bank’s 24X7 e-Lobby services. This card is specially meant for Bank’s Current/Overdraft customers and by using this card they can perform card based cash deposit transactions even with higher deposit limit at Bank’s Bunch Note Acceptor (BNA) / Cash Recycler kiosks. •Instant Cards & issued across branch counters. •Per day cash deposit limit is `10,00,000/-. •Multiple cards can be issued to a particular account and multiple accounts can be linked to a particular card. •Card will be issued to all SB/CA/OD accounts wherever PAN number is registered. “All our customers can avail ‘Deposit Only’ cards for remitting / depositing Cash into our 175+ BNAs / Cash Recyclers installed across the length & breadth of the country. These unique cards will empower our valued customers especially our corporate customers and businessmen to deposit cash / business proceeds to their account, round the clock, even at different locations. In future, these cards may be permitted with interoperable cash deposit (ICD) transactions i.e., cash deposit at other Banks’ BNAs/Recyclers, when NPCI ICD initiative is enabled at Bank.” said Shri Mahabaleshwara M S, Managing Director & CEO of the Bank, on the occasion of unveiling Deposit Only Card here at Bank’s Headquarters, Mangaluru.